Indoor/outdoor fiber optic cables include loose tube and tight buffer designs. These are available in a variety of configurations and jacket types to cover riser and plenum requirements for indoor cable and the ability to be run in duct, direct buried or aerial/lashed in the outside plant. Applications of tight-buffered distribution cable will be provided in this article. This blog provides information on tight-buffered distribution cable’s basic sense and its indoor and outdoor applications. Standard tight-buffered distribution cable is available in fiber counts from 6 to 144 fibers. 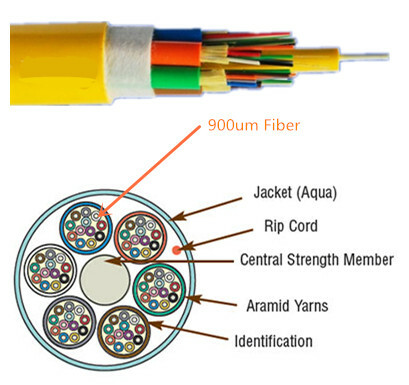 Distribution cable in 6, 12, and 24-fiber counts in a “single jacket” designs feature 900µm tight-buffered fibers surrounded by an aramid yarn strength member. Larger distribution cable (36 fibers and greater) features a “sub-unit” design that simplifies fiber identification, provides easy access and routing of the fibers and increases cable durability with a dielectric central strength member. For example, a 144-fiber cable usually has twelve 12-fiber sub-units while a 36-fiber cable could have six 6-fiber sub-units or three 12-fiber sub-units. Tight-buffered distribution cable can be directly connected to optical equipment for the fibers normally have a 900µm buffer. Terminated fibers may be directly connected to equipment without use of a patch panel and accompanying jumper cables. Besides, no splices or splicing skills are needed, as with pigtails on loose tube gel-filled cables. In situations where the fibers will be mated and unmated frequently, or where there is general access to equipment, it is advisable to place terminated fibers in a patch panel to avoid damage to the connector/fiber interface. Fiber optic tight-buffered distribution cable is used within buildings to provide high-density connectivity and ease of installation. Applications include intra-building backbones, routing between telecommunications rooms and connectorized cables in riser and plenum environments. For trunking applications where fiber distribution cable is being run through environmental airflow spaces, we should plenum tight-buffered distribution cable. It is in compliance with NEC section 770.179(a) for installation in plenums and air ducts. In vertical runs, as shown in the figure below, we usually use riser tight-buffered distribution cable. Armored LSZH tight-buffered distribution cable features a double LSZH jackets with the outer jacket being of UV stabilised, water and moisture resistant. Between the 2 sheaths there is a corrugated steel tape making the cable rodent proof. The cable is suited for LAN backbones, direct burial, ducts, under floor or ceiling spaces. The tight-buffered design provides a rugged cable structure to protect individual fibers during handling, routing and connectorization. Yarn strength members keep the tensile load away from the fiber. Multi-fiber, tight-buffered cables often are used for intra-building, risers, general building and plenum applications. FS.COM offers a wide range options on high-quality tight-buffered distribution cables which can meet your demands on indoor or indoor/outdoor applications. Same-day shipping from USA is available. For more information, please visit www.fs.com. This entry was posted in Bulk Fiber Cables and tagged 900µm buffer, Distribution Cable, tight-buffered cable, tight-buffered distribution cable on December 5, 2016 by Alice.Gui. Ever wonder the difference between loose-tube 250um bare fiber and tight-buffered 900um fiber? Loose-tube 250um and tight-buffered 900um fiber cables actually start with the same 250um bare fibers that feature the same size fiber core (i.e., 50um for multimode and 9um for singlemode), 125um cladding and soft 250um coating. The difference between these two cables all lies in the cable construction. Tight-buffered 900um fiber includes an additional 900um layer of hard plastic over the 250um fibers for protection. Within the cable, several of these color-coded 900um tight buffered fibers are situated around a central strength member and then covered with Kevlar or aramid yarn for protection, a rip cord and then the jacket. Tight-buffered 900um fiber cable comes in various fiber counts that typically range from 2 to 144 fibers, with larger fiber counts featuring fiber subunits of 6 or 12 fibers within the cable. For example, a 144-fiber cable usually has twelve 12-fiber subunits while a 36-fiber cable could have six 6-fiber subunits or three 12-fiber subunits. Loose-tube 250um fiber places up to 12 bare 250um fibers inside a flexible plastic tube, which are also color coded and situated around a central strength member with Kevlar or aramid yarn for protection. Buffered loose-tube cables feature an outer waterblocking tape around the tubes, beneath the outer jacket. The tubes themselves are gel-filled to prevent water migration, or they are available with a dry waterblocking technology—sometimes referred to as gel-free cable. Both of these materials are vital to prevent water from migrating into the tubes and potentially freezing, expanding and breaking the fiber. Dry waterblocking technology significantly reduces installation time by eliminating the need to clean off the gel prior to termination. Loose-tube 250um fiber cable comes in various fiber counts that typically range from 6 to 144. With the exception of a 6-fiber cable, the fibers are grouped into sets of 12 for maximum density. Speaking of density, without the 900um plastic coating, loose-tube 250um fiber cables are less than half the size of 900um fiber cables—1.4 inch (35.6 mm) for a 144-fiber tight buffer cable and only 67 inch (17 mm) for an outdoor 144-fiber loose-tube cable. Generally speaking, tight-buffered 900um fiber cables are used for indoor applications, including intra-building riser and plenum applications and in the data center. Loose-tube 250um fiber cables are typically used in outside plant (OSP) applications, such as inter-building duct, aerial and direct buried installations. While indoor/outdoor cables are popular for eliminating the need for service entrance splicing to in-building cable, OSP loose-tube 250um cabling must be terminated within 50 feet of entering a facility. To accomplish this, breakout kits are used to build the 250um cable up for protection and termination to 900um connector boots. The problem with breakout kits is that they add additional material costs and a significant amount of labor. One option is to terminate the 250um fiber directly to 250um connector boots. 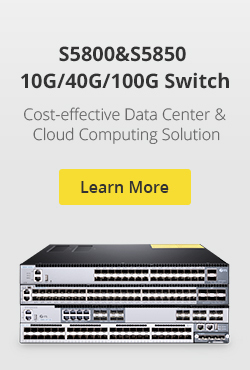 This can speed network deployment in the data center and fiber-to-the-home applications. This entry was posted in Bulk Fiber Cables and tagged 250um fiber cable, 900um fiber cable, cable construction, fiber cables, fibre, fibre cables, Loose Tube, tight buffered fiber, tight-buffered cable on June 14, 2016 by Alice.Gui. Loose Tube or Tight Buffered Fiber Optic Cable? Fiber optic cable is available in many physical variations, such as single and multiple conductor constructions, aerial and direct burial styles, plenum and riser cables, etc. But there are two basic styles of fiber optic cable construction: loose tube fiber and tight buffered fiber. 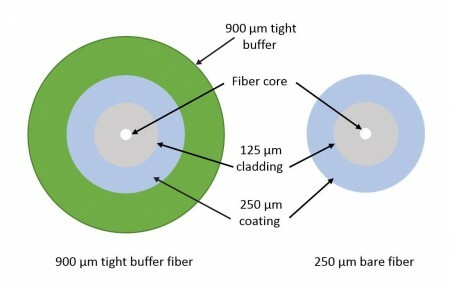 From the picture below, we can see that loose tube fiber holds more than one optical fiber, each individually sleeved core is bundled loosely within an all-encompassing outer jacket. However, in tight buffered cables, there are not so many cables as loose tube fibers. Loose tube fibers are designed for harsh environmental conditions in the outdoors. In loose tube cables, the coated fiber “floats” within a rugged, abrasion resistant, oversized tube which is filled with optical gel. Since the tube does not have direct contact with the fiber, any cable material expansion or contraction will not cause stress on the fiber. This gel also helps protect the fibers from moisture, making the cables ideal for high humidity environments. Cable containing loose buffer-tube fiber is generally very tolerant of axial forces of the type encountered when pulling through conduits or where constant mechanical stress is present such as cables employed for aerial use. Since the fiber is not under any significant strain, loose buffer-tube cables exhibit low optical attenuation losses. 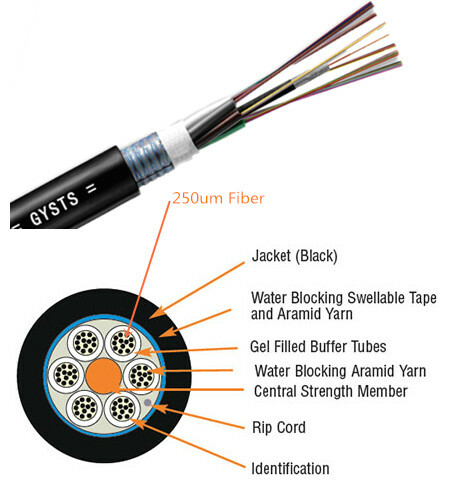 Although loose-tube gel-filled fiber optic cables are used for high-fiber-count, long-distance telco applications, they are an inferior design for the Local Area Network applications where reliability, attenuation stability over a wide temperature range and low installed cost are the priorities. Tight buffered cables, in contrast, are optimized for indoor applications. In the tight buffer construction, instead of using the gel layer loose tube cable has, it uses a two-layer coating. One is plastic and the other is waterproof acrylate. So tight buffered cables may be easier to install, because there is no gel to clean up and it does not require a fan out kit for splicing or termination. Because the fiber is not free to “float” however, tensile strength is not as great. Tight buffer cable is normally lighter in weight and more flexible than loose-tube cable and is usually employed for less severe applications. Such applications include moderate distance transmission for telco local loop, LAN, SAN, and point-to-point links in cities, buildings, factories, office parks and on campuses. Tight-buffered cables offer the flexibility, direct connectability and design versatility necessary to satisfy the diverse requirements existing in high performance fiber optic applications. Each construction has inherent advantages. The loose buffer tube offers lower cable attenuation from microbending in any given fiber, plus a high level of isolation from external forces. Under continuous mechanical stress, the loose tube permits more stable transmission characteristics. The tight buffer construction permits smaller, lighter weight designs for similar fiber configuration, and generally yields a more flexible, crush resistant cable. So, you should choose the appropriate cable for your applications. Fiberstore offers both loose tube and tight buffer cables with high quality and low price. It may be your optimal choice to buy optic products. This entry was posted in Bulk Fiber Cables and tagged Loose Tube, Loose-tube cable, Tight Buffered, tight-buffered cable on August 26, 2015 by Alice.Gui. Recently, as the fiber optic cable is used more and more widely than earlier years, people also know more about the fiber optic cables than before. Usually, we learn that the fiber optic cables are divided into two basic types: single mode fiber and multimode fiber. However, according to the fiber optic cable is used for indoor or outdoor, there are many other fiber types too. These fiber optic cable types are all the popular ones which are available in the current market. Then I will introduce these various fiber types to you in this article. In terms of indoor fiber optic cables, distribution cable, breakout cable, ribbon cable and LSZH cable are some popular types. 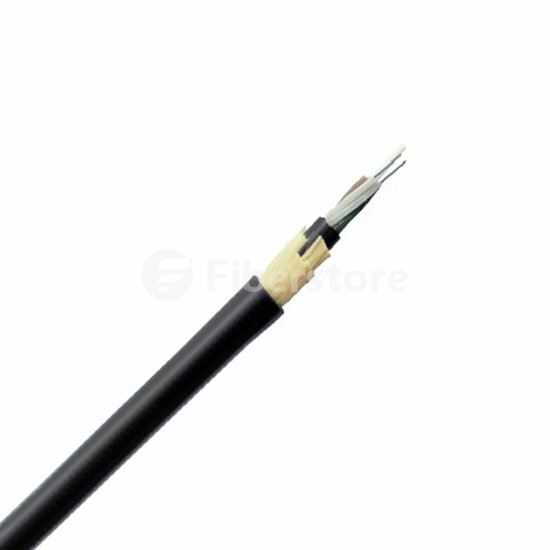 Distribution cable and breakout cable all contain several jacketed simplex optical fibers packaged together inside an outer jacket, but in distribution fiber optic cable, tight buffered fibers are bundled together, with only the outer cable jacket of the cable protecting them. Besides, buffered fiber in distribution cable is 900 µm, which is smaller in size and costs less than breakout cable. Distribution cable is usually installed in intra-building backbone and inter-building campus locations. And breakout fiber optic cable is suitable for short riser and plenum applications. Ribbon cable includes up to 12 fibers contained side by side within a single jacket and is often used for network applications and data centers. LSZH cables are offered as an alternative for halogen-free applications. They are less toxic and slower to ignite which makes them a good choice for many internal installations. In terms of indoor fiber optic cables, however, tight buffered cables, loose tube cables, armored cables and submarine cables are some common popular fiber cable types. Among them, submarine fiber optic cables become more and more popular in recent years. These cables are used in fresh or salt water. To protect them from damage by fishing trawlers and boat anchors they have elaborately designed structures and armors. Other cable has armors is armored cable. Armored fiber optic cable includes an outer armor layer for mechanical protection and to prevent damage. They can be installed in ducts or aerially, or directly buried underground. Armor is surrounded by a polyethylene jacket. Tight buffered cable and loose tube cable are two early common outdoor fiber cables. Tight buffered cables have riser and plenum rated versions. These cables are flexible, easy to handle and simple to install. In loose tube cables, tube encloses multiple coated fibers that are surrounded by a gel compound that protects the cable from moisture in outside environments. This cable is restricted from indoor use, typically allowing entry not to exceed 50 feet. All these indoor and outdoor fiber optic cables play an important role in optical network. As they have different characteristics, they have different applications too. For this reason, when you choose fiber optic cables, you must take their usability into consideration. For more information, you can visit Fiberstore, which designs and manufactures all these popular fiber optic cables. This entry was posted in Bulk Fiber Cables and tagged Armored fiber optic cable, Breakout fiber optic cable, Distribution Cable, fiber optic cable, fiber optic cable type, Loose-tube cable, LSZH cable, ribbon cable, submarine cable, tight-buffered cable on July 24, 2015 by Alice.Gui. Fiber optic “cable” refers to the complete assembly of fibers, other internal parts like buffer tubes, ripcords, stiffeners, strength members all included inside an outer protective covering called the jacket. Fiber optic cables come in lots of different types, depending on the number of fibers and how and where it will be installed. It is important to choose cable carefully as the choice will affect how easy the cable is to install, splice or terminate and what it will cost. Next, we will introduce 5 types of fiber optic cable in communication. When it is necessary to run a large number of fibers through a building, distribution cable is often used. Distribution cable consists of multiple tight-buffered fibers bundled in a jacket with a strength member. Typically, these cables may also form subcables within a larger distribution cable. Distribution cables usually end up at patch panels or communication closets, where they ar hooked into devices that communicate with separate offices or locations. These fibers are not meant to run outside of office walls or be handled beyond the intial installation, because they do not have individual jackets. Distribution cables often carry up to 144 individual fibers, many of which may not be used immediately bu should be considered for future expansion. Breakout cables are used to carry fibers that will have individual connectors attached, rather than being connected to a patch panel. Breakout cables consist of two or more simplex cables bundled around a central strength member and covered with an outer jackets. Like distribution cable, breakout cables may be run through a bulding’s walls, but the individual simplex cords can then be broken out and handled individually. As is the case with distribution cable, breakout cables may end up in communication closets, but in the case of breakout cables, users can manmually change connections. Breakout cables may also be used to connect directly to equipment. Armored cable, addresses the special needs of outdoor cable that will be exposed to potential damage from equipment, rodents, and other especially harsh attacks. Armored fiber cable consists of a cable surrounded by a steel or aluminum jacket which is then covered with a polyethylene jacket to protect it from moisture and abrasion. It may be run aerially, installed in ducts, or placed in underground enclosures with special protection from dirt and clay intrusion. When a fiber optic cable must be suspended between two poles or other structures, the strenth members alone are not enough to support the weight of the cable. Installers must use a messenger cable, which incorporates a steel or dielectric line known as a messenger to take the weight of the cable. The cable carrying the fiber is attached to the messenger by a thin web an hangs below it. Also called Figure 8 Fiber Optic cable for the appearance of its cross section, messenger cable greatly speeds up installation of aerial cable by eliminating the need to lash a cable to a pre-run messenger line. In applications that will run near power lines, the dielectric messenger is ofen used to minimize the risk of energizing the cable through induced current, which is created when the electrical field from a high voltage alternating current line expands and contracts over a nearby conductor. 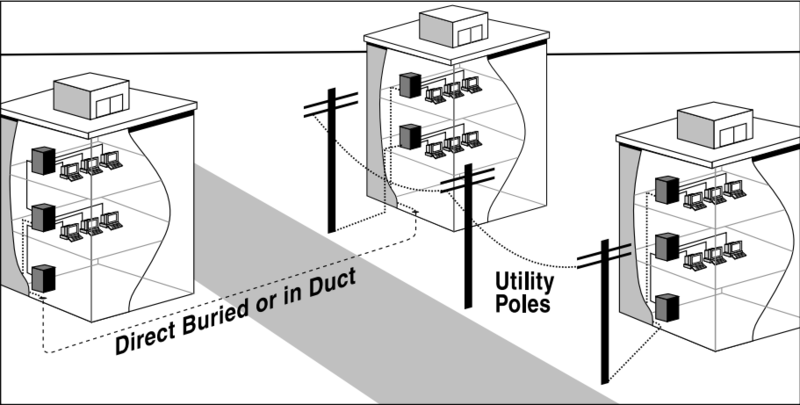 If a conductive cable is close enough to the alternating current, the induced current may be srong enough to injure someone working near the cable. It’s a good practice, in fact, to use dielectric strength members wherever tension considerations permit, as this will help avoid any potential conductivity problems in the cable. Hybrid cable, as applied to fiber optics, combines multimode and single-mode fibers in one cable. Hybrid cable should not be confused with composite cable, although the terms have been used interchangeably in the past. 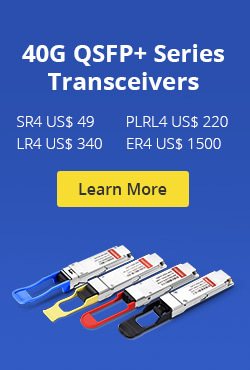 FiberStore is one of the industry’s fastest growing fiber optic cable manufacturer, specializing in providing quality, cost-effective retailing, wholesale and OEM fiber optic products. For more information on bulk fiber optic cable and customization service, please email to sales@fs.com or visit fs.com. This entry was posted in Bulk Fiber Cables and tagged Armored cable, Breakout Cable, Distribution Cable, fiber optic cable, Hybrid cable, tight-buffered cable on September 3, 2014 by Amelia.Liu. Choosing the right fiber-optic cable has become more challenging than ever. The advent of new cable designs, many suppliers, changes in fiber specifications, and the many claims of cable performance can confuse even the most seasoned designers.The selection of the basic cable design is most dependent on the application and installation environment. The main objective in the cable design is to protect the fiber from stress and other environmental forces during installation and over the life of the product. From a technical standpoint, more than one type of cable may fit the bill for many applications. In that case, other factors such as ease of use, size, and cost will be added to the evaluation and selection process. Let`s begin outside. The outdoor environment subjects a cable to the most extreme range of environmental condi- tions. These conditions include a wide operation-temperature range, thermal shock, wind loading, ice loading, moisture, and lightning. Therefore, protecting and preserving the optical properties of the fiber is a design priority. The most proven fiber-optic cable technology for long-term reliability outdoors is the loose-tube, gel-filled design. This type of cable protects the fiber from stresses caused by the environment, namely moisture and temperature. Loose-tube cables, whether flooded under the jacket or water-blocked with dry, swellable materials, protect the fibers from moisture and the long-term degradation moisture can cause. As we all know, Fiberstore is the largest bulk fiber optic cable supplier, we provides a wide range of quality optical fiber cables with detailed specifications displayed for your convenient selecting. Overall, loose-tube cables offer the best protection in an outdoor environment, especially in the less-sheltered applications involving aerial or direct-buried installations. The loose-tube design isolates the fibers from outside environmental and mechanical stresses. The optical performance is virtually unchanged as the cable is exposed to the elements. Telcordia Technologies, BICSI, RUS (Rural Utility Service), and the telco and cable-TV markets support this design. This Loose Tube Type ADSS Cable from Fiberstore is ideal for installation in distribution as well as transmission environments, even when live-line installations are required . As its name indicates, there is no support or messenger wire required, so installation is achieved in a single pass, making ADSS an economical and simple means of achieving a fiber optic network . At the other extreme is cable suitable only for indoor use. The indoor environment is less hostile and not subject to the extremes seen outdoors. Indoor cables traditionally have been a tight-buffered design with either a riser or plenum rating. These cables must conform to National Electric Code requirements for riser or plenum applications. Tight-buffered cable designs typically offer a smaller package and more flexible cable. The 900-micron buffered fiber is easier to connectorize, and the cable is generally easier to prepare for termination. These cables do not typically provide protection from water migration and do not isolate fibers well from the expansion and contraction of other materials due to temperature extremes. Tight-buffered cables, often called premise or distribution cables, are ideally suited for indoor-cable runs. OM4 fiber optic cable is tight-buffered cable we often see in many applications such as Local Area Networks (LAN) backbones, Storage Area Networks (SAN), Data Centers and Central Offices. Now you`re wondering, “What do I do if I need to go in and out? Do I need to buy two types of cables and splice them at building entry?” Actually, until a few years ago, that is exactly what you had to do. Fortunately, design and materials have evolved to meet the needs of indoor/outdoor applications with a variety of cable choices. The most prevalent choice today is a loose-tube, gel-filled, riser-rated cable. This design offers all the proper outdoor protection, and the riser rating allows it to be run within the building (except in the horizontal). There are also loose-tube plenum-rated cables available. This entry was posted in Bulk Fiber Cables and tagged Loose-tube cable, tight-buffered cable on August 15, 2014 by Amelia.Liu. Fiber optic cables are the medium of choice in tele communications infrastructure, enabling the transmission of high-speed voice, video, and data traffic in enterprise and service provider networks. Depending on the type of application and the reach to be achieved, various types of fiber may be considered and deployed. Multimode cable has a large-diameter core and multiple pathways of light. The two most commnon are 50 micron and 62.5 micron. Multimode fiber optic cable can be used for most general data and voice fiber applications, such as bringing fiber to the desktop, adding segments to an existing network, and in smaller applications such as alarm systems. Both 50- and 62.5-micron cable feature the same cladding diameter of 125 microns, but 50-micron fiber cable features a smaller core (the light-carrying portion of the fiber). Also, both also use either LED or laser light sources. Although both can be used in the same way, 50-micron cable is recommended for premise applications (backbone, horizontal,and intrabuilding connections) and should be considered for any new construction and installations. The big difference between the two is that 50-micron cable provides longer link lengths and/or higher speeds, particularly in the 850-nm wavelength. 50 micron OM4 fiber optic cable now save up to 30% off sale in our store, if have interest, search Fiberstore on google. Single-mode cable has a small 8–10-micron glass core and only one pathway of light. With only a single wavelength of light passing through its core, single-mode cable realigns the light toward the center of the core instead of simply bouncing it off the edge of the core as multimode does. Single-mode cable provides 50 times more distance than multimode cable does. Consequently, single-mode cable is typically used in high-bandwidth applications and in long-haul network connections spread out over extended areas, including cable television and campus backbone applications. Telcos use it for connections between switching offices. Single-mode cable also provides higher bandwidth, so you can use a pair of single-mode fiber strands full-duplex for up to twice the throughput of multimode fiber. Simplex has one fiber, while duplex zipcord has two fibers joined with a thin web. Simplex (also known as single strand) and duplex zipcord cables are tight-buffered and jacketed, with Kevlar strength members. Because simplex fiber optic cable consists of only one fiber link, you should use it for applications that only require one-way data transfer. For instance, an interstate trucking scale that sends the wieght of the truck to a monitoring station or an oil line monitor that sends data about oil flow to a central location. PVC cable (also called riser-rated cable even though not all PVC cable is riser-rated) features an outer polyvinyl chloride jacket that gives off toxic fumes when it burns. It can be used for horizontal and vertical runs, but only if the building features a contained ventilation system. 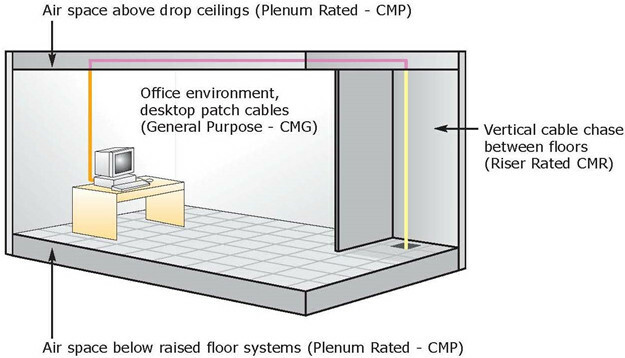 Plenum can replace riser, but riser cannot be used in plenum spaces. “Riser-rated” means that the jacket contains PVC. The cable carries a CMR (communications riser) rating and is not for use in plenums. Distribution-style cables have several tight-buffered fibers bundled under the same jacket with Kevlar or fiberglass rod reinforcement.These cables are small in size and are used for short, dry conduit runs, in either riser or plenum applications. The fibers can be directly terminated, but because the fibers are not individually reinforced, these cables need to be broken out with a “breakout box” or terminated inside a patch panel or junction box. Breakout-style cables are made of several simplex cables bundled together, making a strong design that is larger than distribution cables. Breakout cables are suitable for conduit runs and riser and plenum applications. Fiberstore supply high quality Multi-purpose Breakout Cables which facilitates easy installation of fiber-optic connectors. Buy Bulk Fiber Optic Cable on our worldwide online store with your confidence. There are two styles of fiber optic cable construction: loose tube and tight buffered. Both contain some type of strengthening member, such as aramid yarn, stainless steel wire strands, or even gel-filled sleeves. But each is designed for very different environments. Loose-tube cable is specifically designed for harsh outdoor environments. It protects the fiber core, cladding, and coating by enclosing everything within semi-rigid protective sleeves or tubes. Many loose-tube cables also have a water-resistant gel that surrounds the fibers. This gel helps protect them from moisture, which makes loose-tube cable great for harsh, high-humidity environments where water or condensation can be a problem. The gel-filled tubes can also expand and contract with temperature changes. There are many fiber cable types of loose tube, for example, ADSS Cable is used by electrical utility companies as a communications medium. But gel-filled loose-tube cable is not the best choice when cable needs to be routed around multiple bends, which is often true in indoor applications. Excess cable strain can force fibers to emerge from the gel. Tight-buffered cable, in contrast, is optimized for indoor applications. Because it’s sturdier than loose-tube cable, it’s best suited for moderate-length LAN/WAN connections or long indoor runs. It’s easier to install, as well, because there’s no messy gel to clean up and it doesn’t require a fan-out kit for splicing or termination. You can install connectors directly to each fiber. This entry was posted in Bulk Fiber Cables, Multi Mode Fiber (MMF), Single Mode Fiber (SMF) and tagged ADSS Cable, fiber optic cable, LAN, multimode cable, PVC cable, Single-Mode Cable, tight-buffered cable, WAN on August 13, 2014 by Amelia.Liu.